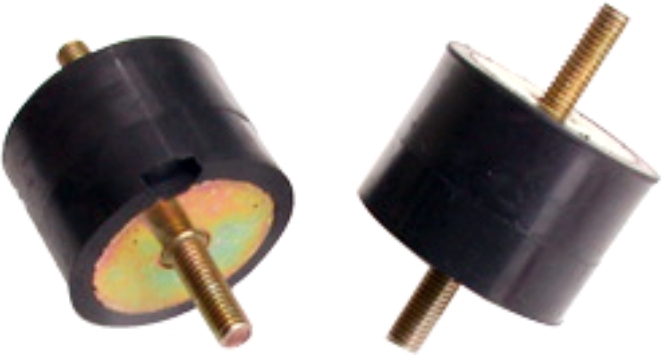 Easyflex Type EFRO mounts are very versatile and can be ideal for a wide range of applications where simple and compact anti-vibration mountings are required. They are suitable for loads in shear, as well as in compression. These mounts are used in an extensive range of applications including compressors, generators, air conditioners, pumps, fans, motors, laboratory equipment, scales, etc. Type ‘EFRO’ mounts are comprised of an elastomer bonded between two metal plates. The dynamic and static properties of the unit are determined by the composition and configuration of the elastomer. High strength bonds are specially compounded elastomers provide high load carrying capacity and assures long life. Simplicity of design and unitized construction provide low cost mounting systems which are compact, light-weight, easy to install and maintenance free.